It’s definitely shaping up to be a year in which religious-themed movies are coming out of “Hollywood.” And, “God’s Not Dead” is the latest in a lineup of films including “Son of God” and the upcoming Darren Aronofsky epic “Noah.” Bringing in the money, the movie took the number 4 spot at this past weekend’s opening box office. If you’ve completely missed this movie, it’s of no surprise. The distribution company marketed heavily to churches, religious-affiliated universities, and through their website. “God’s Not Dead” is a narrative drama about a freshman at university in a philosophy class who is challenged to prove God’s existence or risk being failed. Does he prove his argument about God’s existence? You’ll just have to watch and evaluate for yourself. Usually, acting suffers largely in a Christian film. But, the majority of the performances in this movie were surprisingly good. Shane Harper who plays the protagonist Josh, a freshman at the fictional Hadleigh University in Louisiana (who has purple trashcans like LSU–hmm), does a very good job and gives a solid performance as the student charged with this daunting task. His co-star Kevin Sorbo, who plays the atheistic professor Jeffrey Radisson, gives an equally commanding performance as the passionate and threatened professor. Although, one of the most powerful performances in the movie is delivered by Trisha Lafache’s character of Amy, a journalist. And the douchebag lawyer brother is impeccably portrayed by Dean Cain. At the heart of the film is this argument between cynic and believer, but the film introduces a plethora of other characters and subplots that are unnecessary to the integrity of the film. There is a journalist with a cancer diagnosis, a brother and sister caring for a mother with dementia, and a Muslim girl who defies her overbearing father by embracing Christianity. The movie would have done just fine with the main story and maybe one of the other subplots. The time it took to write in those subplots should have been spent on other areas of the film. The film is clearly designed to counter Hollywood’s more typical “Godless” efforts. But is it effective? Sometimes it is, to be honest; but it will speak mainly to those who already define themselves as true believers. This movie has the makings of a great film. Not a great Christian film; but a great film–period. The story structure was excellent, pacing was good, plot was sound, and the production value was on par for a college drama. The film fails in terms of editing, cinematography (what’s with all the closeups? ), and dialog. Unfortunately with all this film had going for it, the writers had to overload the dialog with God. Obviously, as two characters put it, “God is good all the time…and all the time God is good,” but what good is a movie with a powerful and well-executed logical argument about God’s existence if the rest of the dialog is so weighed down that it’s a turn-off to non-believers? The logic used in Josh’s arguments in his philosophy class for the existence of God was sound, even from an agnostic or atheistic perspective. And, that is the power of the message in the movie. Using the tools of logic, science, and reasoning to prove the existence of God. 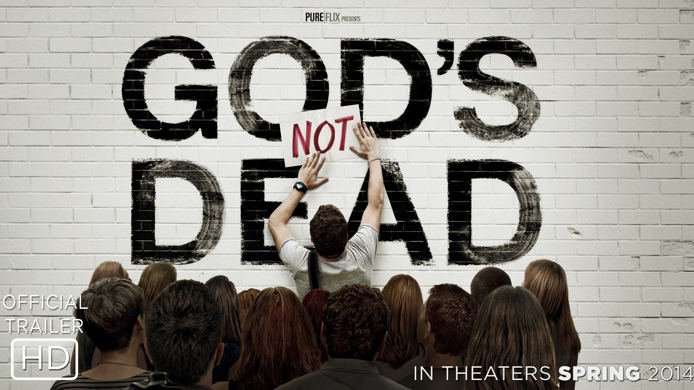 “God’s Not Dead” is a testament to Christian filmmakers that high quality is possible and that there is definitely an audience for the films. In terms of comparing it to standard Hollywood films, it has come closer than any other Christian film before–and even much better than some of what has been coming out of major studios lately. Where the writers and director need to improve is executing and packaging the movies in such a way that they attract non-believers who can potentially benefit more from the message rather than reinforcing what believers already know. But over all, good job.